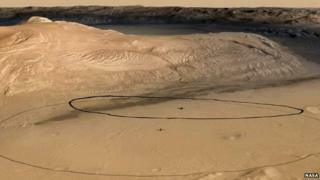 The US space agency (Nasa) says it has narrowed the expected landing zone for its Mars rover, Curiosity. The 900kg robot is heading for a touchdown on 6 August (GMT) in a near-equatorial depression on the Red Planet known as Gale Crater. Controllers have drawn an ellipse on the surface that is just 7km by 20km. They say they can hit this target because of their confidence in the high-precision landing system attached to the rover. This system will use thrusters to guide the high-velocity phase of the robot's entry into the Martian atmosphere - a technology not available on previous lander missions. A large parachute and a rocket-powered cradle will manage the final moments of the descent. Nasa says that by tightening the extent of the ellipse, down from the previously envisaged 20km by 25km, it can cut the time taken by the rover to roll to its primary science location. This is the base of a 5km-tall mountain in the middle of Gale Crater known as Mount Sharp. Scientists expect Curiosity to find layered rock deposits at this site. These sediments should provide new insights on past environmental conditions on the Red Planet - conditions that may have supported microbial life many billions of years ago. "We have reduced the amount of time it takes to traverse to that point by several months - perhaps as many as four," explained Pete Theisinger, the rover project manager at Nasa's Jet Propulsion Laboratory in Pasadena, California. "And that allows a greater duration of prime mission at those key science targets and the accomplishment of science objectives." The encapsulated Curiosity, also known as the Mars Science Laboratory (MSL), was launched in November last year. Engineers are using the nine-month, 570-million-km-long cruise from Earth to the Red Planet to check out the rover's systems. All 10 of the scientific instruments it will use on the surface appear to be in good health. However, the mission team has lingering concerns about the drill Curiosity will employ to grind up rock samples for analysis. This tool has a tendency to shed a Teflon coating as it manages the movement of powdered samples through its interior. Nasa has so far spent about $2m on an experimental programme designed to understand how this contamination will affect the analytical chemistry conducted by the rover. But John Grotzinger, the rover project scientist from the California Institute of Technology, told reporters he was not that worried about the issue. "It is not a serious problem because we see so many ways to work around this," he said. Nasa will be making the third of six possible corrections to the mission's cruise trajectory in the next fortnight. Three further opportunities for fine tuning are available in the last week before arriving at Mars. New software to command the entry, descent and landing (EDL) has also just been uploaded. This will be required to command all aspects of the journey down to the surface. The huge distance between the planets on 6 August, means it will take 13.8 minutes for a radio signal from Curiosity to be received by controllers - far too long a period to allow any intervention from Earth. The rover's entry capsule is due to hit the top of the Martian atmosphere just after 05:10 GMT. It will then take six or seven minutes to reach the surface, depending on factors such as the wind. Touchdown is therefore expected at about 05:17 GMT. Given the light-travel time involved, signals confirming these events should be received at Earth at 05:24 GMT and 05:31 GMT (06:31 BST) respectively. Landing on Mars is notoriously difficult, and most of the missions despatched from Earth have failed to get down in one piece. The Americans, though, have an excellent recent record, and Nasa is bullish about the performance of Curiosity's EDL system. "There is never a guarantee of success, but we have done everything prudently possible to ensure that our probability of success is as high as possible," said Dave Lavery, a senior Nasa official on the rover project. The $2.5bn (£1.6bn) mission is funded for an initial two Earth years of operations, but MSL-Curiosity has a plutonium battery and so should have ample power to keep rolling for more than a decade. It is likely the mechanisms on the rover will wear out long before its energy supply.